You need to add person days so we can keep this as a major calendar. I have to choose other workplaces to put personal stuff on it. As a night shift nurse with two jobs. This makes it soo easy for my to keep track of my shifts. Other apps get confused with nights starting in one day and going to another. This keeps it simple with colors and sun and moon icons to keep me sane and organized!! Because my work schedule is the center of everything this has become my go to calendar for just about everything. One minor thing I wish could be added is the ability to input a particular pattern and have it automatically schedule it out. This might not seem like a big deal for some but scheduling ahead of time with a 9 week pattern. can become somewhat time consuming. Very convenient to look for a schedule. Suggestion: please add family tab but not a vacation. Thank you! I practically use this app more than my regular calendar since my work schedule affects my “social” life. My only qualm is that it’s hard to see what the current date is, even though it’s in bold. It would be MUCH easier to see if the current date had maybe a circle around it. Switching between day and night shifts is hard enough where I don’t know where in the month we are in the first place. Otherwise, I love this app! Love this app and love that you can see colleagues schedules which is so helpful. However, I wish there was an option to switch from pictures to the actual times of the shift in the calendar view. It would be helpful for someone who rotates and rarely works just a “regular” 12 hour shift to know exactly when I work just by looking at the calendar instead of clicking on each day individually. It works fine other than the icon for the shift is appearing incorrectly. It is displaying a crescent moon icon for day shift and a sun rise icon for night shift. Don’t really write reviews but after looking at my other options it’s hands down the best app for scheduling. I only wish I could see multiple colors for one day If I’m scheduled more than one place a day. Also wish there were more colors. I work at a variety of places and uses all the colors now I have to repeat some. It gets confusing. Otherwise I love the app. Thank you! Absolutely in love with nurse grid! Always using it and downloaded the app for all my coworkers to use so we’re able to see each others schedule! SOOOOO happy that the color PINK just came back!! Was so sad when you guys changed it! 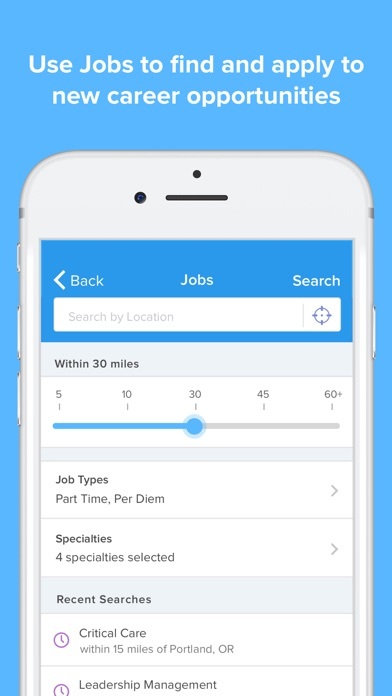 One thing I would love to incorporate are “PSL (paid sick leave) and “PTO” (Paid time off) as one of the options.. if that can be incorporated along with all the vacation tab, unavailable tab etc.. this app would be even MORE amazing. Please and thank you! The only thing I can think of for improvement is adding the ability to attach an image to the shift notes (for adding photos of shift switch forms from employer). I need more options for my personal events please! 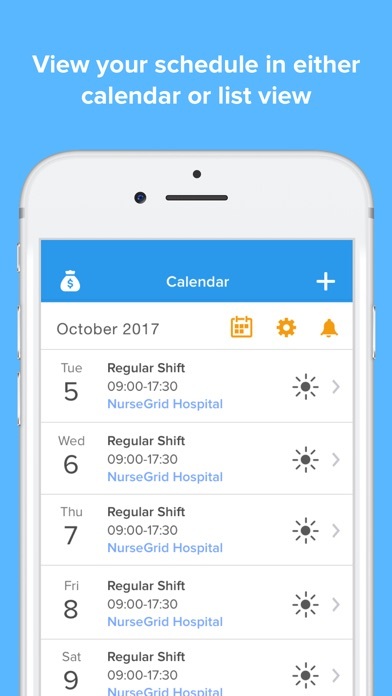 This app is wonderful, simple to use, easy to enter my shifts and even easy to enter personal events. But I need reminders for my personal events and it would be great if I could make a note when I’m entering my personal events. Instead of putting in the event, saving it, then going back into the event to create a note for what the event is for. I wish we can color code different shifts! I do 8hr and 12 hour shifts. But when I input in the app, it would show the same icon. So I would have to click on the date to see what shift I’m actually doing. And I so so wish we could compare schedule with other users! So we can actually plan a day off together with other nurse friends! I love the ease of use of the app and the social media aspect of it. Everything about it is easy and intuitive. My one complaint, and it’s a big one for me, is that the app doesn’t sync with google or Apple calendar. It’s great to be able to see and swap shifts but, if i can’t see it layered with the rest of my life schedule it’s pretty difficult. I hope this will be in an update. I normally don’t write reviews, nor do I ask for help with an app issue. But I’ve been pretty reliant on this app (it’s that great) that when it did crash on me, on a last bid of desperation, I contacted support for this app. They corrected the issue with the update and emailed me a couple of times with status updates. The customer support is phenomenal. The app is great. I’m dependent on it to view my schedule so that I don’t miss a shift. Love it and highly recommend it to anyone whose schedule is all over the place. This app is amazing. It let me keep up with my busy work schedule and in touch with coworkers until..... it stop working. I am unable to open the app. I’ve updated my phones software and download the app multiple times and nothing seems to work. I’m a saddened that I am unable to use this app anymore! The app will no longer sync with my calendar since the last update. Very disappointed since that feature was very helpful. Currently looking for a new app to use since finding any support for this one is impossible. Worked for about a month. Now it won’t even open. Just crashes every time. My phone and the app are both updated too. This app is a piece of trash. Like the app but I really wish there was an option to delete messages! I live using NurseGrid but I would love for the “personal” stuff to be a different t color or something though. It’s hard to distinguish between the two. 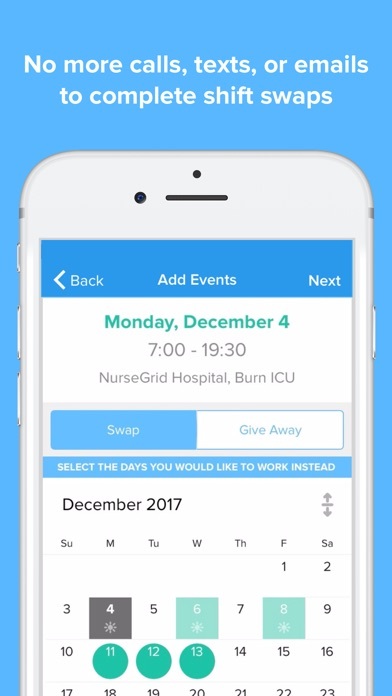 This was a great app to keep and store my work schedule as a nurse. I loved that I can add my different work sites and color coordinate them. Now I do not like the app. My hospital merged but doesn’t actually use the app for scheduling, so now everything is locked. Unfortunately, I might have to find a different app to store my schedule. It’s unfortunate that everything is locked because the hospital merged but my manager has no access. It was nice while it lasted. 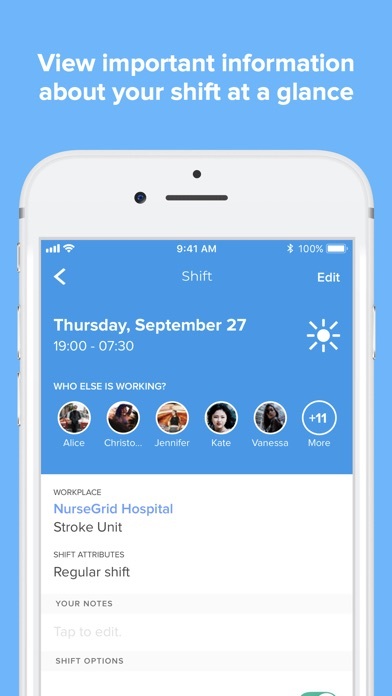 Maybe the next update can allow nurses to still use and add worksites without needing a managers approval but still let managers change schedules. App won’t open my schedule, stuck in load screen, then crashes. Also, lag times are worse now than before. I really love this app! Please update! This has so much potential. I have been using it for years and it has been reliable. My only question is why no iPad version. It would be nice to see this in a bigger view, like the iPad. The app wont open and u cant put ur schedule. The app froze after the last update. Nice job. Loved this app until recently. I loved having my schedule at my finger tips. Recently it is taking forever for the app to load and open if it does at all. I’ve deleted and downloaded again but that hasn’t helped. Hopefully this is fixed soon. This is such an amazing app! My colleagues and I use this so we can see who’s working on what day. May I suggest: To put in a function wherein you can compare 2-3 people’s schedules along your own to see what days they’re working together and what days they’re off together. I feel like its a great feature since there are days I’d like to see my close friends outside of work and since this app makes it easy to see work schedules individually already, it’ll be nice to compare schedules like that. Thank you! Hope you can put that into consideration! 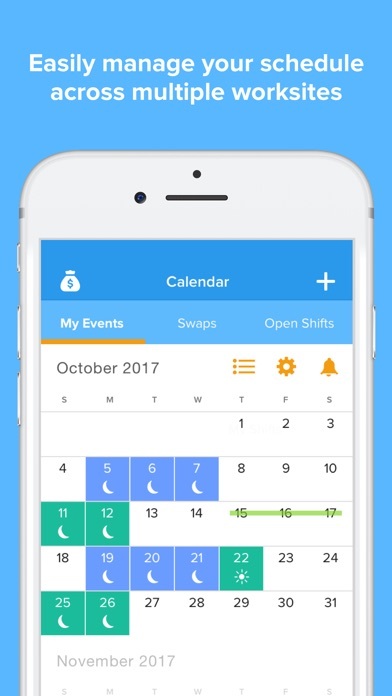 This app works great, but can we please have the option to change the start of the work week? Our work weeks are Monday to Sunday...not Sunday to Saturday. I downloaded this app because it sounded perfect to help keep track of my work schedule...I ended up deleting it because I couldn’t enter my workplace as it’s not a healthcare center. A version of this app for EMS would be awesome, though! Great concept :) It would really come in handy as I work for 2 agencies and my husband does as well. Definitely helps me stay organized, but the lag time after you tap something is frustrating. It’s not my phone because I have plenty of storage and this is the only app that does it. If that’s fixed it will be a 5 star app! I love the app! And it has been used as my calendar more than the other calendar apps available in app store. But I hope when you view the grid as a whole month, there would be a red dot (or something better) that indicates there is a note (only viewable by the owner of the account) included on the days there is a note written. Because right now, you need to view each day to see if there is a note or not. Love this app, but the last update has made everything suuuuuppppperrrr slow. Please fix. I don’t want to switch apps. This makes it so easy to keep up with my 3 jobs! I also enjoy seeing which of my coworkers on are shift with me that day. I love it! I use this app and find it useful. However, I find it frustrating and and dread entering my schedule in or having to change it because when I touch the date or edit or really anything it’s slow to respond or takes multiple attempts. And no this isn’t my phone and several of the nurses I work with have said the same thing. Please fix this as it is very annoying! Thank you! Would give it 5 stars if it functioned properly. So I love the app totally. My only wish was that I wish it wasn’t connected full time to the internet. That there was maybe an offline mode saved periodically so that you can check as needed. I have to screenshot it sometimes every 2 weeks to make sure I keep my schedule straight. Please fix this! Private messages can’t be deleted! Please fix that! This app is amazing and super helpful when it comes to easily visualizing my schedule and checking when my friends have off. One thing that I’d love to see is a feature to add short text to a calendar day to remind me of plans so making switches stays organized! This is the only thing I feel is missing — otherwise great app! 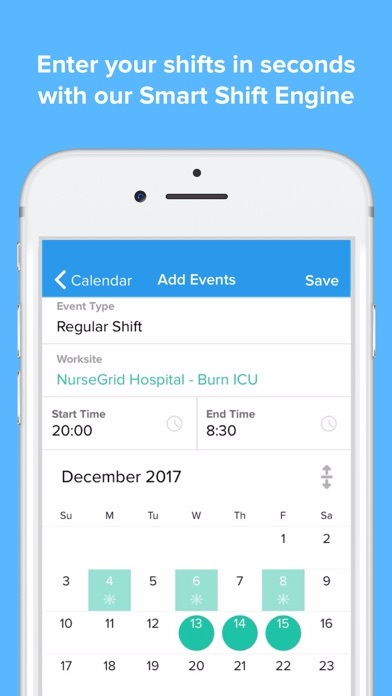 NurseGrid is PERFECT for staying organized for every shift. It also allows you to see colleagues schedules to make trading shifts easier. Being a new grad RN, I love how it counts how many shifts I’ve worked. Very simple and organized app that I rely on. I wish there was a way to include the 1,2,3,4 week schedule. Ex: 12hr nurses must work 1 4-day week every 4 weeks. I would love for it to be a way to include the # weeks so it’ll be easier to keep track. For now, I still have to use a paper calendar.